Big sheds, grim concrete, rusting steel, walkways painted in industrial blue. Bustling vendors in oilskins and wellington boots; porters scudding around on motorised carts. Polystyrene confetti, puddles of melted ice. Stacked crates. Reefer trucks. 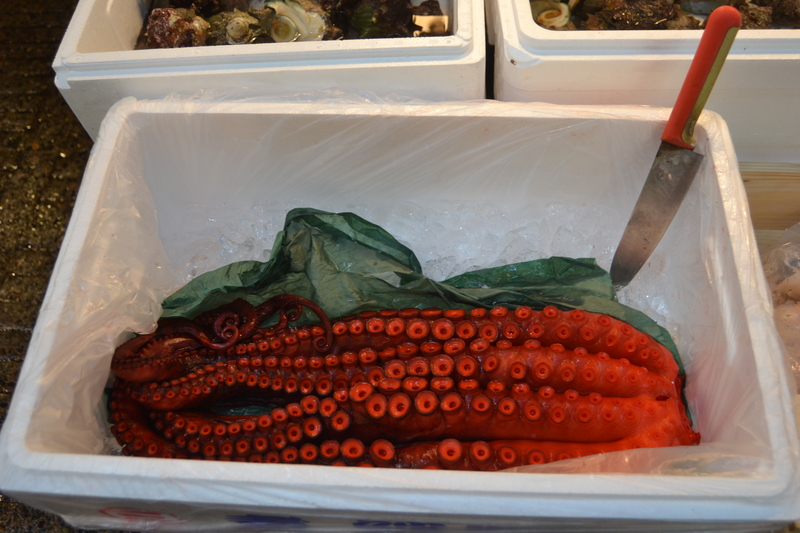 Everything, in short, you would expect of a municipal fish market, right down to the smell. 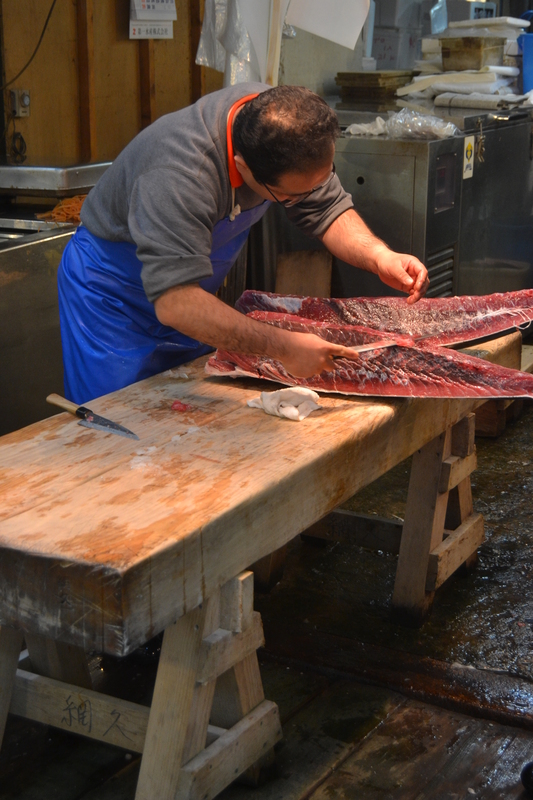 But it is not just any municipal fish market: it is Tsukiji Fish Market, by common consent one of Tokyo’s Must See sights. The guidebooks explain, as if with a trumpet fanfare, that it is the World’s Largest Wholesale Fish Market. What next, you might wonder: Asia’s Deepest Sewage Tunnel? Japan’s Oldest Scrapyard? The Lonely Planet Fundamentalists are there at five in the morning, half an hour before the trains start to run, clutching guidebooks flagged up with Post-it notes as they queue in the hope of joining one of the two groups of sixty let in to watch the tuna auction. 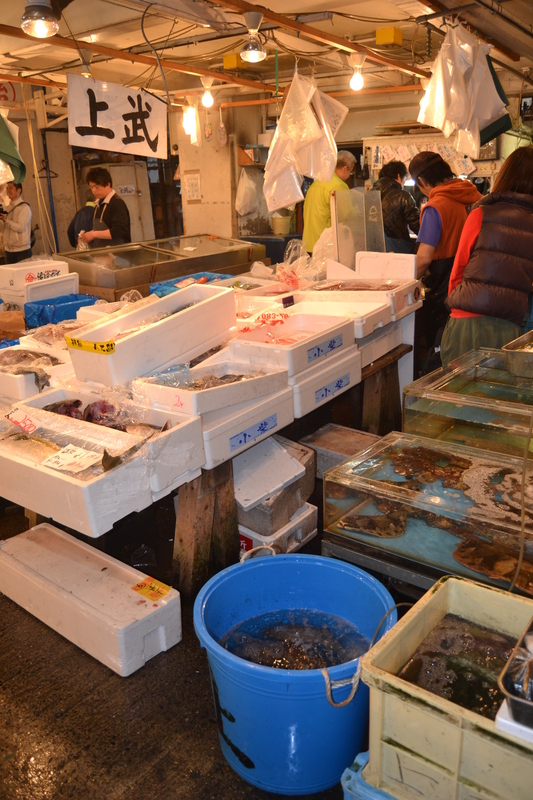 The frozen fish are laid out on pallets. Sceptical restaurateurs peer at the eyes, lift the gills, shine their torches into cavities. The auctioneers jump up on boxes, ring handbells, doff their caps and shout and bounce excitedly, like contestants in some incomprehensible game show. Bidders raise hands casually as if acknowledging a friend, and porters hook the sold tuna and drag them away, then return for the pallets, and hose down the floor as another auction starts across the room. After nine, when the market is quieter, tourists are allowed into the wholesale areas and march fully armed with SLR’s and telephoto lenses across the flooded cobbles, down the aisles between the stalls barricaded with teeming fish tanks and Styrofoam boxes, and stop to watch the fishmongers butchering tuna on trestle tables with knives like swords, and fire off a few shots of chopping boards dripping with blood and hoses left running and boxes stuffed with silvery bass and orangey snapper and brilliant white squid and octopus tentacles as thick as your arm and coiled eels in buckets of water. The stallholders struggle past them and ignore the staccato clicking of camera shutters and the tourists kneeling to get selfies with severed tuna heads. Mercifully there is no room for star jumps. It is an improbable tourist attraction, but compelling. 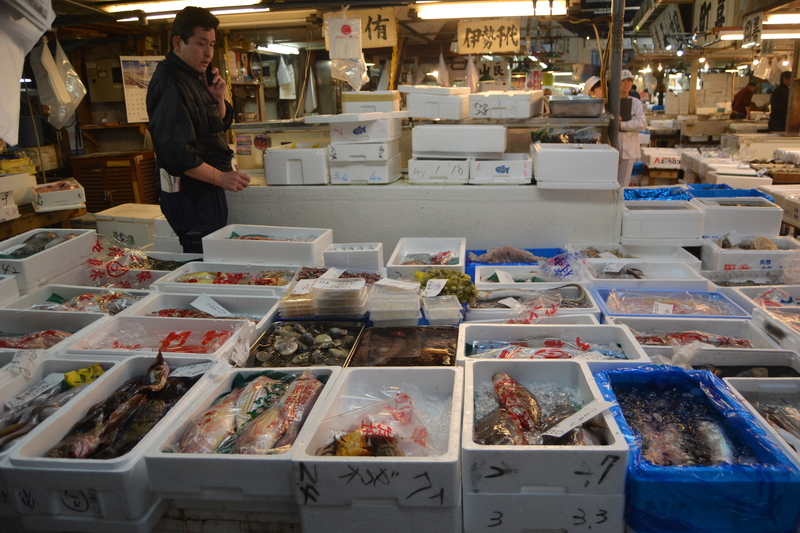 By eleven, the vendors start to pack up and close their stalls and the tourists put their cameras away and join the queues outside the sushi restaurants, where they stand for an hour or two or three and some get bored and peel off to browse the stalls selling knives and pans and bags of dried fish, and the door occasionally slides open and the tourists look briefly hopeful until it slides shut again. There is room inside, at a squeeze, for around a dozen at the bar and tables. The sushi chefs work centre stage, slicing, moulding, plating up; another, stage right, stirs a vat of rice with a paddle. “How fresh is the fish?” someone behind me in the queue asked a regular. “Well, it was swimming an hour ago,” came the reply. I went there some five years ago, got utterly lost in Shimbashi and, even if we moved out late, managed to arrive so late that even the very last Lonely Planet Talibans had left, every single stall had packed up, all boxes had been neatly put away, cart drivers had called it a day and there was only one elderly man meticulously reducing a big pyramid of a tuna into small chips thanks to a pair of knives he must’ve borrowed from Rambo. All in all, I liked it better without anyone else but him. Story of my life down there!